taken down the river, to Grand Gulf, where the rebels, had built some formidable batteries, the place is very high, but the naval forces of the U.S. under the Command of rear admiral Porter took this point on the 3rd inst. after a severe engagement. The fortifications are of a strong nature, the walks and magazines are beautifully constructed. Met a number of my friends here; thousands of our troops are concentrating here for the great advance on Vicksburg with the intention to conquer there or to die. 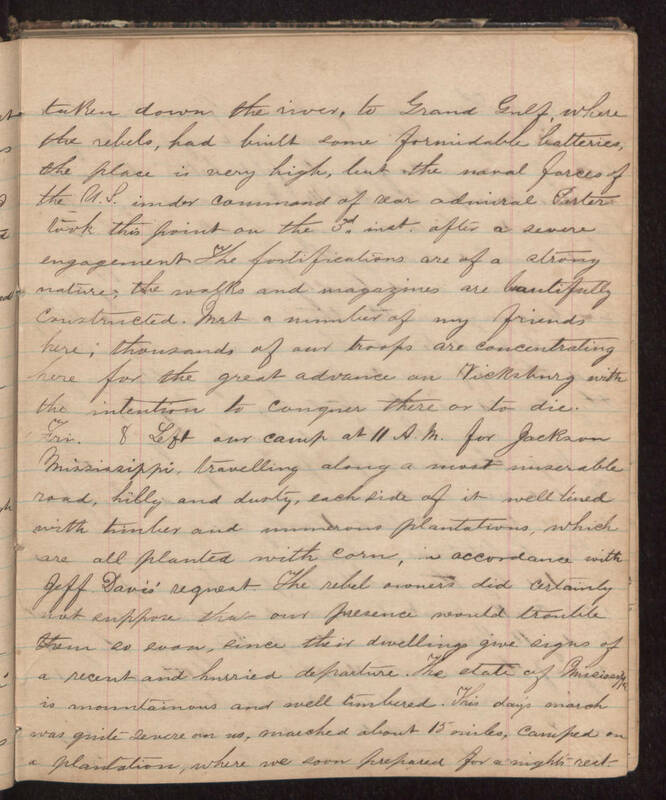 Fri. 8 Left our camp at 11 A. M. for Jackson Mississippi, travelling along a most miserable road, hilly and durty, each side of it well lined with timbers and numerous plantations, which are all planted with corn, in accordance with Jeff Davis’ request. The rebel owners did certainly not suppose that our presence would trouble them so soon, since their dwellings give signs of a recent and hurried departure. The state of Mississippi is mountainous and well timbered. This day’s march was quite severe on us, marched about 15 miles, camped on a plantation, where we soon prepared for a nights rest.